“But, I’m not an early childhood advocate.” Of course, you are! The word advocate refers to a person who publicly supports or recommends a cause or policy. Do you talk with people about early childhood education? Tell them about your classroom? Share what your child learned in preschool or what you learned in your college course? Do you like AzAEYC on social media and share our posts? Then you are an advocate, educating others on the importance of high-quality early childhood education. And, the Arizona Public Policy Forum was designed for you! The early childhood workforce and families of young children are the best advocates for our cause. You are the experts who know what is most needed for Arizona’s young children and families. The early childhood field is so diverse and unique that we need representation from every region, program type, and perspective of the early childhood workforce and families. Sharing your story and experiences brings to life the initiatives that are addressed every day in statewide system building meetings and policy discussions. By coming together as part of the Arizona Public Policy Forum and helping to establish an Arizona Early Childhood Advocacy Network, we will join as a shared voice supporting what is most important, our youngest children. Arizona early childhood educators, administrators, students, parents, and system partners are invited to attend this first annual policy and advocacy event. AzAEYC, in partnership with SAZAEYC and Arizona Child Care Resource and Referral, have received funding to launch the first annual Arizona Public Policy Forum. This event will take place on February 20, 2019 from 1:00 – 8:30 pm at The Newton at 300 W. Camelback Rd. in Phoenix. The Arizona Public Policy Forum will feature a keynote address and overview of the Arizona Early Childhood System with a focus on how early childhood initiatives are funded and how state agencies, non-profit organizations, early learning programs, and community leaders work together to support children, families, and the early childhood system in our state. Tell your story and experiences. Remember, you are an expert in how you interact with the early childhood system. We need to hear from you! Connect with other advocates from your community and begin action planning to continue spreading the word at the grassroots level. Arizona Legislators will be invited to attend the Arizona Public Policy Forum dinner and to network with early childhood experts (YOU!) from their districts. Finally, to close out the evening there will be an exclusive screening of Won’t You Be My Neighbor? This film explores the life and legacy of Fred Rogers, the beloved host of the popular children’s television show Mister Roger’s Neighborhood. Join us to learn how your voice can be heard and how to share your new-found skills with other early childhood professionals and families in your own community. 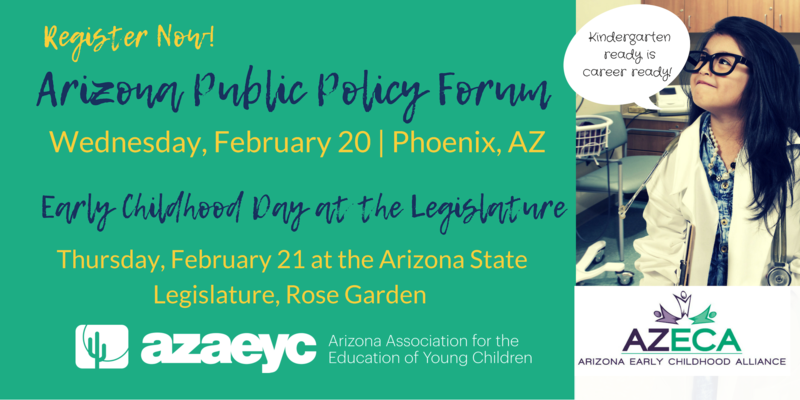 Attending the Arizona Public Policy Forum will help prepare you for Early Childhood Day at the Legislature. Early childhood champions are gathering to raise awareness of the importance of the early years at Early Childhood Legislative Day on February 21, 2019 in the Rose Garden at the Arizona state capitol. Network with friends and legislators, as we show how early childhood development and health contribute to healthy children, third grade literacy, enhanced economic development and strong communities! Early Childhood Day at the Legislature was a huge success in 2018. Check out our photo essay from last year’s event at the State Capitol! Grant funding will provide sponsorships for early childhood advocates from across the state to have the opportunity to join the Arizona Early Childhood Advocacy Network and attend the Arizona Public Policy Forum. Live outside of the Phoenix Metro Area? Apply NOW! Through an application process, interested educators, directors, parents, students, and administrators who reside outside the Phoenix Metro area could be selected to attend the event for no (or minimal) fee. In addition to the opportunity to receive Professional Development hours in the AZ Early Childhood Registry, transportation, lodging, meals, and entertainment will be included. In exchange for this opportunity, Sponsored Advocates will be asked to commit to supporting and participating in follow-up advocacy events in their local community. Whether you are from the Phoenix metro area or from locations throughout the state, we hope you will join us at the 2019 Arizona Public Policy Forum! Together, we can work to create opportunities across our state that help all children and families succeed.